Balance your constitution with this drink! How to make your own smoothie bowl! Goa, South India, burning sun, 40 degrees, 4 o clock pm. And a girl folding forward in shoelace over her yoga mat. “Breathe into the pose” says the teacher. Well said, but the tension in the right side of my lower back makes it hardly possible to breathe anyhow. But I keep breathing, with closed eyes and quiet mind, being aware and embracing all the sensation this Asana caused in my body. Inhale the calm, exhale the tension. Again and again. I breathe in deeply into my belly and suddenly it happens: I have that feeling between my chest and belly, difficult to describe. Feels like relief. Relief about being able to be, feel and love myself. Tears are running down my cheeks. And with every exhale my heart softens, melting over my knees. This tension in my lower back is slowly disappearing. And with every exhalation I feel freer. Each inhale was love and connection, each exhale liberation. The next was me asking for a tissue and my teacher responding: “Oh of course, – Students, I will go and get some tissues. I see some of you will need it.” I was not the only one who experienced the clearing tears dropping down during the beautiful Yin moment of surrender. That was my first Yin Yoga experience with Anushree (dearly called Anu) during my TTC. And somehow it was nice to know that I wasn’t the only one needing a tissue. There were more like me, entering deeper into their Self, being able to connect and release — permitting healing tears. Because that’s what Yin Yoga does. It connects, it heals. 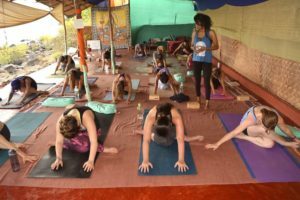 We were all impressed by the power of Yin Yoga and its ability to help us connecting with the deepest parts within ourselves. Time after my TTC I talked to Anu about Yin Yoga. Yin Yoga has been with Anu since she started her yoga practice more than 10 years ago. From that first moment this style was taking an important role in her “growing process”. 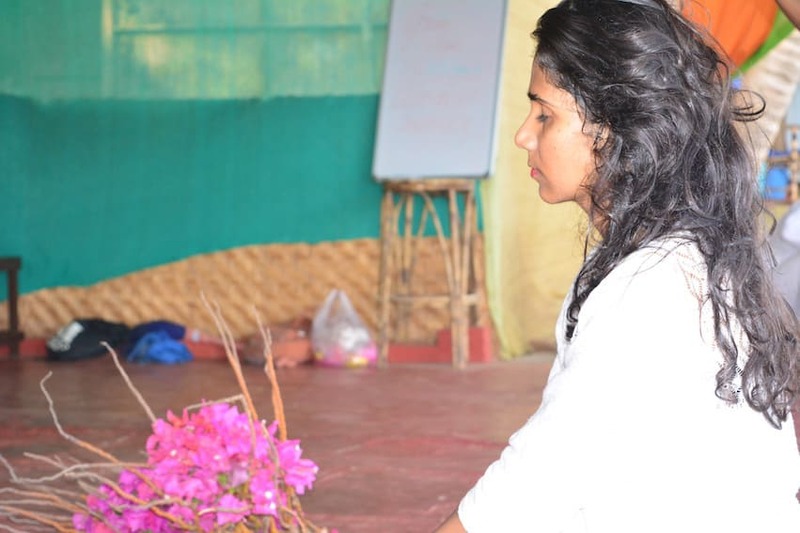 She shares with us her experiences with Yin Yoga and the importance of sthiram sukham asanam. These words from the Patanjali Sutras represent the attitude which it needs to be yoga — and not simply stretching. It simply means that a posture, the asana, should be steady and stable but at the same time easy and comfortable. So even if you struggle at first in a pose, you should find with your breath the tranquility in your mind in order to enjoy the pose — adjustments are totally allowed. That’s the self-caring character in Yoga: more self respect, less ego. Then you can be relaxed and happy in the pose, feeling the stability and softness at the same time. Unfortunately when I sometimes look in students tensed faces, this second part (Sukham) seems to be less present. And then our Yoga practice is simply a sport program. Yoga is when we cultivate both Sthiram and Sukham in order to experience a balanced practice. Because that’s what turns the practice into yoga: balance. So we need to balance the qualities of Sthiram and Sukham in our practice. And Yin Yoga helps us from within. Balancing polarities in order to feel wholeness is what we do in Yin Yoga. After TCM (traditional Chinese medicine) the whole cosmos follows a system of polarities, of Yin and Yang, which are also present within us — and that’s wholeness. But often we feel stronger imbalances than yogic wholeness. Why? The good news: Just as I caused these imbalances with my mind, I have the power to solve them again — taking care of myself and heal from within. To balance this we have to find the two polarities within our body and heal ourselves. The yin and yang are also in our bodies in relation to the functioning of each organ. For example the lungs, the heart are yin organs and the intestines are yang organs related to the way they function in the body. We must attain a practice where we nourish the organs with food and yoga. But how can we know, what is right for us? Which food? Which diet? Which Yoga? With this overload of information in the West it’s not easy to find whats personally right for me. How do we find the right tools to solve the imbalance, which is not only physically but can appear also emotionally and energetically. Once we know about the imbalance, what comes next? Connection is a keyword. Listening to the body and to what it is asking for is the key to balanced living. I feel the more we are connected and aware, the more we can work with this. So Yin Yoga essentially helps us to connect, to develop the ability to listen to our body, and to know our personal truth. In everyday life that simply means, that you don’t need any diet report to guide you how to eat, but you, connected to yourself and your body, already know what to choose. And that not only applies for food — but for activities, lifestyle, relations and yoga. And sometimes when we cross the layers of our self and enter in deeper connections, this personal truth tells us realities about ourselves — which are not always easygoing. The described experience of my first Yin Yoga class reflects that process. You touch hidden subjects which the practice triggers, and all at the sudden with the power of your breath you are able to solve them — pouring them out with healing tears. This powerful experience I only have in Yin practice. Why? Why is Yin Yoga so healing? Two essential parts of Yin Yoga are mind and breath. With the breath we connect, we calm down, we dominate our mind. And as we control the breath we can control our mind to become still. Turning off our monkey mind in order to enter into a state of deeper consciousness. And when the waves of the mind are still, you can listen to your truth, you connect and heal. It’s the union of body, mind and soul, the union of yin and yang. It’s the union of the self with the higher self. This is the power of yoga: Union. The practice of Yin is the practice of moving with stillness. It’s a complete practice that involves a posture, the breath, as well as meditation. The experience of the real essence of yoga just in one practice. Yin is the style that touches the subtle aspects of my energy. Anu continued that path exploring the poses and their anatomical and physiological affects. The practice of yang (mostly known as vinyasa flow) should be experienced by the same body in order to live the yin and yang styles of yoga. I am Joanna, author, blogger and yoga teacher. I started Yoga Can Do with the idea to share the picture of 'yoga as a whole' - on and off the mat and as a daily lifestyle. To experience the amazing power of yoga. LOVE CONNECT HEAL. I am Joanna, free soul and global yogi. On yoga-can-do.com I want to inspire you to a holistic yogic lifestyle, easy and grounded, honest and real, authentic and free. And as Yoga is about let it go and flow, I say goodbye to old dogma and strict rules and hello to the very personal pathway of yoga. Because the truth is within yourself - listen to it every day! To spread YOGA AS A WHOLE. To clear up misunderstandings about Yoga. To help YOU to experience its full potential. In your life, your relations, your everyday. Experience with me the power of yoga. Experience transformation and healing through Yoga.